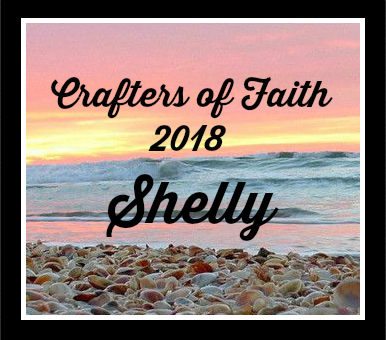 My creative rumblings: COF - "Rock"
For our first Crafters of Faith 2019 challenge, Kelly is our hostess. 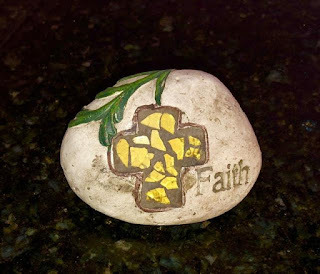 My challenge for you this month is my son's gifted rock! (See the photo inspiration.) Use a rock somewhere on your card. It can be a single stone, river rocks, mountains - however the scriptures speaks to you! And if none of those work, maybe you want to use rock dsp or river rock ribbon, etc. The image is from I Brake for Stamps, it is called Well and Roses. I colored with it with Copics. 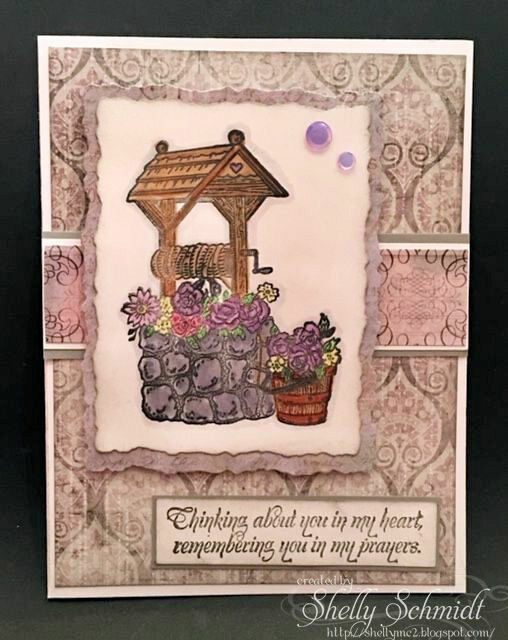 The Sentiment is from Our Daily Bread/aka Divinity Stamps Thinking of You set. The sequins are from Unity Stamps. The die is an older Spellbinders one. HERE is the link for the other COF cards using Kelly's theme over at Splitcoaststampers. Perfect image for the challenge. I love that die that you used; one that I don't have. May your 2019 be an awesome year for you. I love wishing well images, this one is gorgeous! Beautiful sketch too! Thanks for sharing! A beautiful card Shelly - such a pretty image and so well coloured and mounted. Shelly, your card and rock are gorgeous. What a great image and so symbolic for our Lord. Our source for all good things. His deep love for us all. Great card. I love it. Happy New Year! Hope it's a good one for you and your family! Shelly, your card is so sweet. I love the wishing well. Such a sweet card with elegant design. Many thanks for joining us at Colour Crazy Challenges. Beautiful image, I love your coloring and the layout. I have those papers, this goes really well. Great card! 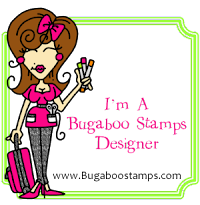 Bugaboo Birthday Bash- 7th & final day! 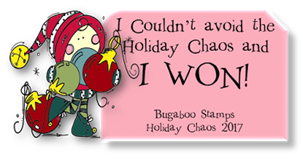 Bugaboo Birthday Bash 4- New Release Day!